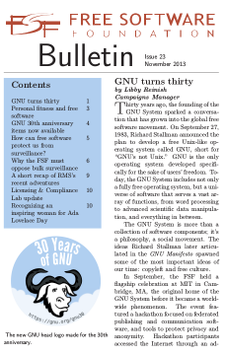 The latest Free Software Foundation Bulletin for fall 2013 is now online. Check it out for interesting articles on free software and free software activism. This edition of the Bulletin features a fantastic piece from FSF campaigns manager Zak Rogoff on combatting surveillance with software libre, "How can free software protect us from surveillance?" It also features an article by Joshua Gay, on wearable computing devices and free software. For those of you who are interested in FSF gear, there's an update from Chrissie Himes, our operations assistant, on GNU 30th anniversary items and our next round of internships in system administration, licensing, and campaigns. You can support more work like this (and receive a nicely printed copy of each bulletin by mail) by becoming an FSF member, which also has other great benefits such as an account on our Jabber service and a 20% discount on everything in the FSF store.